I must beg your indulgence of this one egregious backslide into the jargon of the biker culture. While in my old and failing imagination Delcia does conform to all the romantic, teenage notions of a chick, I would never in a moment of clear conscience or sane mind seriously refer to her by that agnomen. Rather, I mean for this page simply to draw attention to her long fascination with the Harley-Davidson mystique and the fulfillment of her personal ambitions in that realm of motorcycling. On two earlier blog pages, Pilgrim’s Progress(ion) and The Future Is Now, I tried to describe my own path from late-life, two-wheel novice to the prideful ownership of not one but two large and satisfying motorcycles. Delcia’s progress(ion) was no less dramatic and possibly more gratifying. Delcia’s first riding experience and the steep part of her leaning curve were achieved on a Yamaha Virago 250… not a very big machine, but a terrific learning platform. As I confessed earlier, it was Delcia’s decision– during the 2008 gasoline crisis–to buy a motorcycle that set us on this unexpected road. Despite the fact that she had just entered the fiftieth year of her life, she was looking for simple, reliable, cheap, two-wheel transportation she could ride to and from work. She found all that in an economical 250 cc machine from the highly reputable stables of Yamaha. Her Virago 250 was an ideal starting point for her– light enough to handle, wimpy enough not to be terrifying. There might be some truth to the notion that the Virago 250 sounded sufficiently like “Viagra 250″ to motivate my macho response of buying my own motorcycle. Whatever the reason for this new, shared interest, we trained together diligently, mostly on weekends in the deserted parking lots of office complexes and on little traveled back streets. After buying our first bikes in October, it was clear to us on many levels and for a number of reasons that we wanted– and needed– professional rider training. Winter opportunities were few, but in February of 2009 (the month after I retired) we enrolled in and completed our three-day training course with the nationally respected Motorcycle Safety Foundation. (See Milestones ) Because the training is administered by The Georgia Motorcycle Safety Program, our successful completion of the course earned us exemptions from the state’s testing requirements for getting a motorcycle operator’s endorsement on our driver’s licenses. The Vulcan 500 LTD from Kawasaki doubled the size of the engine on Delcia’s ride. Now we were “legal,” and we needed the confidence of our newly earned knowledge and experience because we had already moved on to bigger bikes. For Delcia it meant a step up from a 250 cc putt-around, city bike to a more roadworthy 500 cc machine from Kawasaki. I have to admit I might have been too persuasive in getting her onto this bike. Pretty clearly, I liked the Vulcan 500 LTD a good bit more than she did. Delcia had discovered her original dream bike at a motorcycle show during the winter. Because it was winter, and not much riding was being done, the thought of the Honda Shadow simply smoldered in the back of her mind. Then came spring. I took off on a couple of motorcycle adventures in discovery and returned with thrilling tales of ambitious destinations. And we began riding together a lot more in glorious days of cool sunshine. That smoldering ember became a flame of desire. 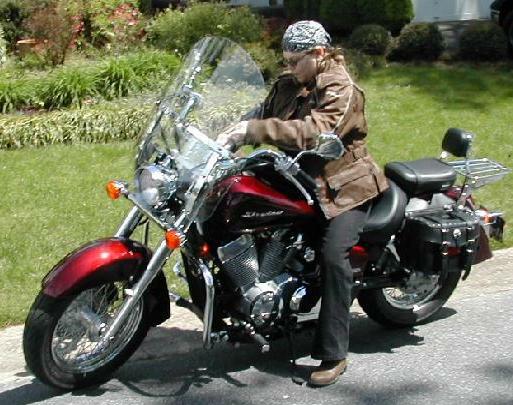 In fact, I cut short a road trip in order to return home and go with Delcia to pick up the brand new Honda Shadow Aero 750 she had bought from a dealer in neighboring Tennessee. Oddly, even though this was the dream bike, and it was a Honda, it probably is also where the Harley ambition was born. This first, gutsy, “classic” road cruiser was an intoxicating foretaste of what might be. But even after the Honda, we were still one big step from accepting the inevitable. It’s difficult to explain the new or expanded dimensions that Delcia and I found in our relationship as a result of riding together. I tried to describe some of that closeness in Two for the Road, but even in the months since that page was written, we’ve enjoyed discoveries about ourselves and about one another that enliven our days both on and off the road. Watching Delcia’s growing, expanding, maturing awareness of bikes and her commitment to riding has revealed aspects of her attitudes and thought processes that I never saw quite so clearly in our twenty years together. Our willingness to discuss the meaning of accomplishments and failures, challenges and fears, concerns for one another, and hopes for the future is at a level we never explored before. Just one of those enlightenments is what I saw as her Harley-Chick phenomenon. And that is where I yield to frustration in writing this page: I find myself unable to explain or describe what prompts the rabid fascination with the Harley-Davidson brand that takes hold of so many motorcyclists. Maybe if I were susceptible to Harleymania I could better reveal its mystic power. But it was easily recognizable in Delcia as it is in all Harley devotees, and it shapes and informs their views and sentiments on bikes and riding and all matters motorcycle. 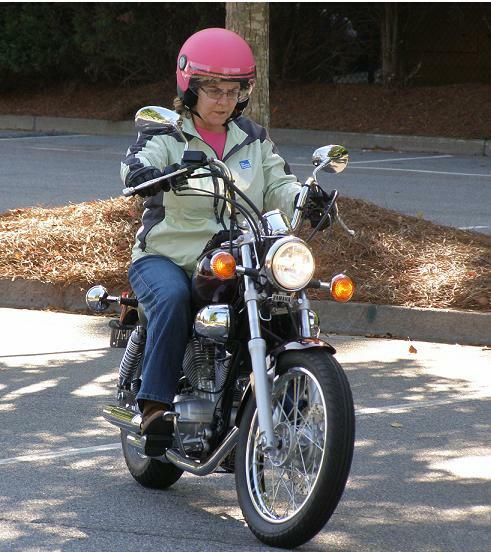 Delcia graduated from street rider to highway traveler on the Honda Shadow. Our day rides grew longer and longer. During our first year of riding, we put our bikes on a trailer and ventured up the east coast. We stopped and unloaded the bikes to ride in Colonial Williamsburg, in eastern Massachusetts, and along the coast of Maine, during three exciting weeks of A Riding Vacation. Later in the year, we took our first overnight, motorcycles-only road trip to a lakeside retreat in Alabama. At a point early in that summer Delcia had discovered the Harley-Davidson Softail Deluxe. The sticker price was higher than the combined prices of the first four motorcycles we bought. And that was for the stripped down starter version. Just to make it road ready, the Softail needed accessories equal in cost to the purchase price of the Vulcan. After she sat on that powerful Harley (more than 1500 cc) and learned something of its character, there was a conspicuous, even visceral, change in Delcia’s approach to riding and her focus on her identity as a woman on a motorcycle. She seemed to have set her mind– and her heart– on a different destination. But Delcia is a financial realist– a hard-nosed pragmatist where money is concerned, and I saw her consciously, willfully push the expensive Softail out of her thoughts. Or at least as far to the side as she could push it. But clearly, the days of the Honda Shadow were numbered. On the Alabama road trip, Delcia discovered the kinds of deficiencies in the Shadow that can only be revealed by long miles and hours in the saddle. The seating position proved uncomfortable after a while and even painful over the long haul. And while a 750 cc engine was big by earlier standards, it showed signs of strain at high speeds and in hilly terrain. Before we had arrived back at our door she was talking about a bigger ride with ergonomic enhancements. I could only smile as I recalled the same complaints and dissatisfactions in my own development as a rider. 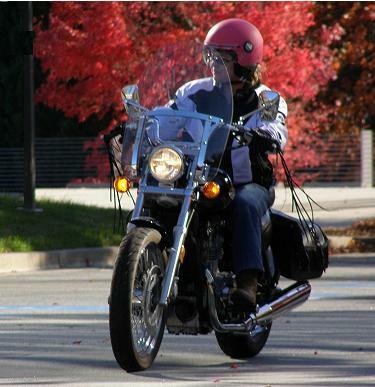 In October of 2009, one year after discovering motorcycles, we both moved up again– a fourth bike for each of us. And they were big. Delcia’s first BIG cruiser – the Yamaha V-Star 1100 Silverado- and my 1500 cc Suzuki. Even Delcia will admit that it was the big, heavy, powerful V-Star 1100 that carried her almost effortlessly over the threshold from novice-intermediate to skilled and confident rider. Any observer could see the casual but attentive authority in her handling of that bike. They were an assertive– sometimes aggressive– team of rider and machine. In anyone else I would have predicted years of contented riding and thousands of satisfying miles to come out of the partnership. But I know Delcia, and this was an experience far less likely to reveal the contentment of what is than to raise the wonder of what might be. “Oh, if this were only my Harley.” And then financial fate took charge. The national economy of 2009 and 2010 blew an ill wind for many of us. I won’t digress into the weeks Delcia spent unemployed when her job was summarily discontinued, or the Phoenix-like resurrection that saw her skills and talents re-valued and a bad dream brought to a comforting end. And I won’t go into the details of a retirement plan that was “cashed out” because of a change in company ownership. But suddenly, my bride, my buddy, my best friend was handed a fistful of cash to save or to squander as she saw fit. And she saw fit to do both. Half was rolled over into her appreciable 401k… and half was rolled into our garage as a 1500 cc muscle bike, Delcia’s 2009 Harley-Davidson Softail Deluxe. Don’t make the mistake of thinking my tight-fisted soul-mate finked out on her principles in order to reach this milestone. She found the bike she wanted– in the only colors she would consider– listed on the Internet. The seller wanted out of biking and into a new car. Delcia got her Harley for 25% off the showroom price, and she equipped it to her specifications by shopping on eBay and getting the gear at half-price. 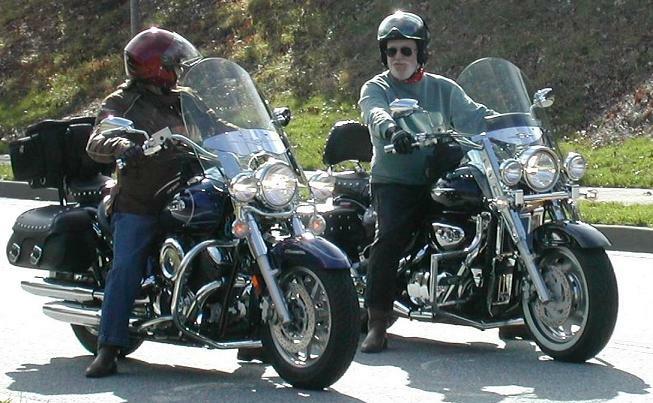 Two weeks after the deal was done, the Harley-Chick and I took off for a long weekend to ride a 500-mile tour of North Carolina’s Blue Ridge Mountains. 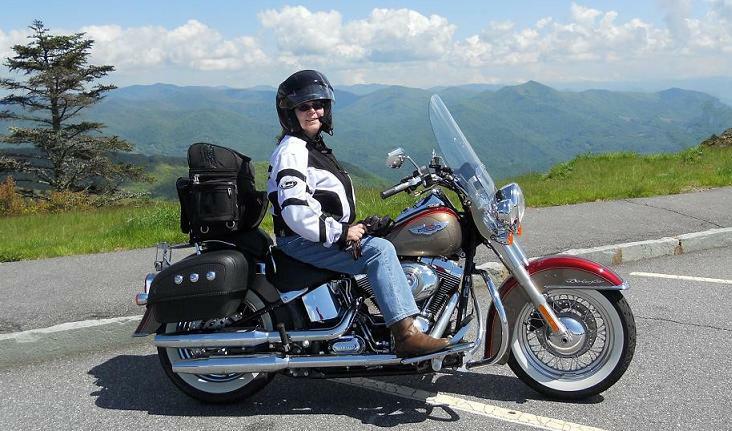 Riding high… with my Harley-Chick and her 2009 Harley-Davidson Softail Deluxe. Hey… I’m burning green with envy. At 76, I guess my ridin’ days are done, but I can recall with joy when, back in the 80’s, I rode my Sportster 1000 on the beach at Daytona, or riding my ’69 Electroglide through the streets of Tampa and St Pete. Riding a motorcycle is like nothing else on this planet. Period! I salute you both for your marriage into bikedom together. What an exciting endeavor to undertake at any age, but especially rewarding when approaching senior-hood. My wife and i ride my gl1800 daily, weather permitting, and we live to ride together. What a HOOT! Ride on friends. Gracias, Enrique, y a usted deseamos el mismo.